A rendering of what the new lobby would look like at the Thunder Bay Theatre. Alpena — $55,000 separates the Thunder Bay Theatre from beginning construction on Phase I of their capital campaign, a campaign to completely reconstruct and revamp the venue in five years. For Phase I, the goal is to completely redo the lobby and entrance, creating a more welcoming and open atmosphere. 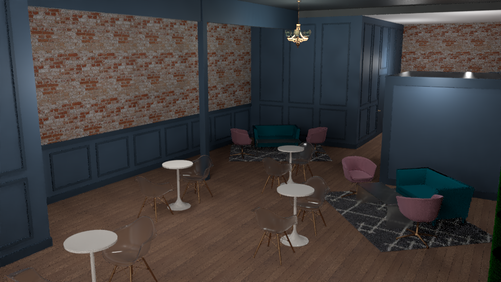 The plan includes refurbishing the floors, removing the office space, moving the box office to the historic cigar humidor within the lobby, bringing back glass windows to let light in, a new entrance, new furniture, and more open space. The whole project will cost $150,000. The campaign is rooted in the Community Foundation For Northeast Michigan. Besser Foundation committed $30,000 to the campaign. The Michigan Council for Arts and Cultural Affairs is providing a $40,000 grant. The Community Foundation for Northeast Michigan provided a quarterly report with $25,000 worth of donations for Phase I. Funding is coming in strong for the reconstruction. Producing Artistic Director Jeffrey Mindock feels very confident heading into the final stretch of fundraising. All eyes lie on the new lobby concept designs soon to be a reality. “We want it to feel and look brand new while still paying an homage to what has come before us,” said Mindock. Mindock’s vision is to incorporate the old with the new. He wants to bring out the historical elements of the former drug store and cigar shop. Mindock also wants to honor the early days of Thunder Bay Theatre when the venue was brand new. Here with Beier: Do it for the Disco!